Playa Giron is a small beach resort close to the Bay of Pigs and loacted in the Matanzas Province 120 KM east of Havana. Giron is 191 km from Havana – about 3-4 hours by bus and around 2-3 hours using your Cuba Rent A Car. A taxi from Havana will cost you around $120. There is a small Bay of Pigs museum and the resort is half an hour’s drive from the interesting Boca de Guama swamps, but that’s about it. Anything else worth visiting is a good two hour drive. The Villa Playa Giron hotel consists of two long, utilitarian blocks surrounded by a strung out series of concrete bungalows and a handful of dirty coconut palms set in a large, rutted, grass field by a rocky beach. Mixture between a Russian Gulag and Stalag 15, stuck it in the Caribbean and you begin to get the flavor. The rooms are around $25pn single and $35pn double. The dismal bungalows are about $40pn and the buffet food is to match. The clientele are mainly on packages. 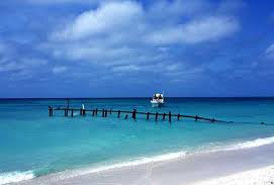 Playa Larga Hotel offers something a little better and is near the Bay of Pigs monument and also on a nice beach.